Pack Fanatic SUP Stubby Air 8'6"
The Stubby Air is the wave board suited to travellers. It combines ease of use with direct responsiveness making it the next level iSUP. The Fanatic SUP Stubby Air 8'6'' presents a parallel rail concept with wide nose and tail sections, and a squashed outline. The stylish double diamond tail with a 2+1 fin setup gives extra hold, drive and snappiness to the board so you can get creative. The Stubby is the inflatable SUP designed for SUP surfing anywhere you want to go. Only 7.8 kgs of weight that make easy to transport with you to this secret spot or your daily break point. Produced in the high tech Double Layer Light technology by Fanatic with its incredible stiffness / weight ratio, the Stubby Air reacts in an instant. Charged with volume, the ride is perfectly balanced and accommodates any size of rider with ease. Convenient transportation with the Wheely Premium Backpack, whilst a Fanatic Power Pump HP2 caters to a quick and easy setup. A mastfoot insert for optional windsurfing rounds off the tremendous range of use. Parallel rail concept wave outline and double diamond tail. Double Layer Light technology, for 20 – 25 % reduction in weight combined with significantly higher stiffness. Top quality / durability – best inflatable SUP construction out there. Produced at the world’s most renowned manufacturer with best materials and production process. Unmatched air pressure / stiffness ratio. Full deck / base quality printing and rail design for superior optics. Thruster fin setup with removable Center fin. Diamond grooving footpad for ultimate grip and comfort. Premium Wheely Backpack for effortless packing / transportation. Fanatic Power Pump HP2 for fast and comfortable inflation. Mastfoot insert for windsurfing option. 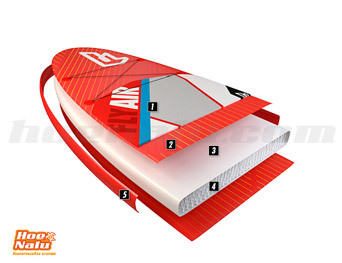 Fins: Thruster or tri fin, 1 x Fly Air 15.5 cm fiber US-Box & 2 x Fly Air 12 cm fixed. What does the Fanatic SUP Stubby Air 8'6'' pack include? An inflatable board of Stand Up Paddle Fanatic SUP Stubby Air 8'6'' 2018. Here you have a video with the Stubby models (inflatable & composite) by Fanatic, watch Airton Cozzolino surfing with the Stubby Air, awesome! Double Layer technology, developed by Fanatic for their inflatable Stand Up Paddle Surf boards, is the best available option in the market. The second layer made of highlt resistant material lets the board's inflation pressure reach 20 psi without impacting integrity. This technology uses the best drop-stitch material available in the market, Double Layer Technology features great rigidity for your allround board, coupled with high performance so you can use it however you want without impacting on the overall weight of the product.